Sleep disorders are abnormal sleep patterns and physiological changes that affect health. Over one third of Americans experience chronic sleep disturbance which contributes to numerous health conditions including: Cardiovascular and respiratory disease, depression, chronic pain syndromes, gastrointestinal diseases and decreased quality of life, among others. Chronic sleep deprivation is an epidemic that can have cumulative neurocognitive effects and exacerbate a broad array of common chronic diseases including obesity, hypertension, diabetes, stroke and coronary artery disease. The effect on gastrointestinal health and disease is profound, albeit typically not recognized or addressed by clinicians. Dysfunctional sleep has been identified in a wide array of GI diseases affecting both visceral and hepatic disease, with both inflammatory and neoplastic induction. Sleep and the GI system have a dynamic bidirectional relationship, effecting a complex balance of circadian rhythms, neurohumoral transmitters and the intestinal microbiome. The resultant effects of this interplay between sleep and GI health/disease is often difficult to define, however, a primary sleep disorder may be exacerbated by a GI disease, such as GERD, or a GI disease such as IBD may be the primary underlying cause of a sleep disorder. Regardless, there is emerging recognition that sleep and GI health may represent new targets for disease intervention. This includes the identification of genomic changes where gene products may be potential therapeutic targets. Additionally, epigenetic changes related to the environment can enhance the transcriptional activity of important genes. Also, clearly the intestinal microbiome is a discovery field for microbial products and activated immune cells that may translocate to the periphery and respond to manipulation. This relationship with sleep is another new horizon of recognition. As these relationships between sleep and GI health have been identified, these findings are logical targets for intervention. As such, a keen and insightful awareness is necessary to maintain good health, or assessing symptoms of a disease state. 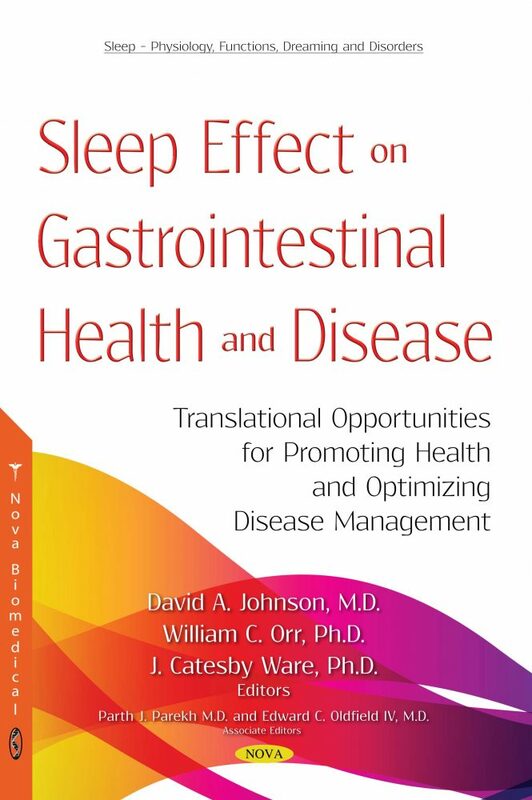 Thus, the recognition of sleep disorders, and appropriate sleep directed management can help optimize the treatment of numerous gastrointestinal diseases. Clearly, people need to recognize that sleep is not just a “placeholder” of dark time between two periods of daylight activity. Rather, assessing and promoting good sleep should be a “health mandate” for maintaining and regulating normal GI physiologic health, or mitigating sleep directed disease management strategies to optimize patient outcomes. Therefore, sleep dysfunction, should be a routine focus of all care providers, recognizing the importance of good sleep for promoting health and sleep disorders in perpetuating disease. It is the meaningful intent of the authors of this treatise to increase the appropriate awareness of the invaluable role of sleep. Clearly, it is time for us all to open our eyes and realize the value of closing them.